She's Fantastic: Black Panther Marvel Legends - NAKIA! Black Panther Marvel Legends - NAKIA! I'm really looking forward to the Black Panther movie. I don't really have much of a connection to the character beyond his 1988 comic miniseries and more modern Avengers tie-ins (and of course the storyline where Shuri became Black Panther). 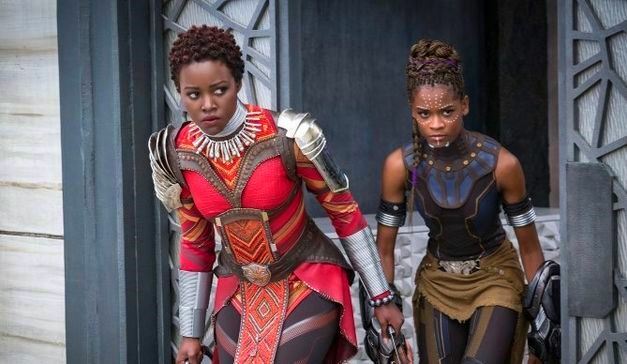 But as soon as details of the film started to emerge and it was revealed that the Dora Milaje was an all-female elite force of warriors protecting the nation of Wakanda. This is like a very cool twist on the Amazons from the DC Universe. Then when the toys were finally revealed, they definitely delivered with two Legends figures of the Dora Milaje - Nakia (played by Lupita Nyong'o) and a build-a-figure Okoye (played by Danai Gurira), plus a non-Legends figure of Shuri and a comic Legends figure of Shuri as Black Panther coming to TRU. The bright colors, cool costume details, and excellent actor likenesses make these some of the most impressive Legends figures I've ever seen. I hope a few more warriors are on the horizon. Let's check out Nakia below! Nakia comes with two chakram-type blades and a short spear-point (which she seems unable to hold). I can't wait to see her use the chakrams, I always thought they were a very dynamic-looking weapon. Here she is with the Okoye Build-a-Figure (review coming next). That head sculpt is superb.